Although the 2013 German elections were viewed as having wider importance for the rest of Europe, the issue of Europe itself played only a minor role in the election campaign. Sonia Alonso outlines results from an analysis of German party manifestos to assess the extent to which parties have emphasised European issues in elections since 1949. She notes that there is a downward trend in terms of the inclusion of European issues in manifestos, and that where European issues are mentioned they are increasingly likely to reflect negative attitudes toward the EU. The coalition agreement between the CDU/CSU and the SPD has been recently approved by SPD members in an internal party referendum, with European citizens playing the role of expectant witnesses. Despite the wish of many Germans to the contrary, it matters a great deal for the future of Europe the type of government that is finally formed in Germany. This is why the 2013 German election was so closely followed in other EU states. Now that we know how the election story ends (and the government’s story begins), it would be a timely exercise to analyse German parties’ positions on Europe, as reflected in their electoral manifestos. These political texts contain the electoral promises made by German parties during the campaign. How much space did German parties dedicate to promises related to EU matters? What were their exact positions on Europe? How close were the SPD and the CDU/CSU on the subject of Europe? It was a widespread view at the end of the German electoral campaign that Europe had received little attention. This may well be true of candidates’ speeches and mass media coverage (until now we have not seen data on this) but the picture would be incomplete without looking at party manifestos. 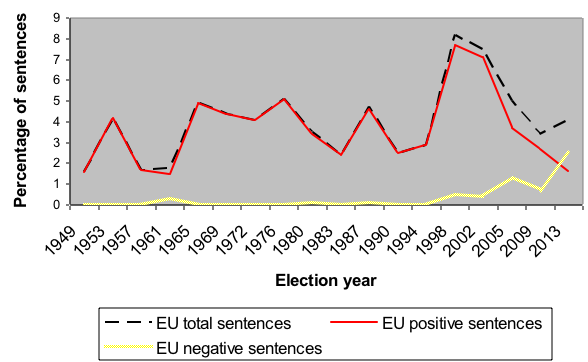 Figure 1 presents data from the Manifesto Project showing the average percentage of sentences dedicated to European issues by German parties since the first post-war elections in 1949. There was a peak of attention to European issues in 1998, when party manifestos dedicated on average 8 per cent of sentences to it. Since then, attention has progressively decreased: in 2002 it declined to an average of 7.5 per cent; while in 2005, it fell to 5 per cent. In 2009, the year after the financial crisis broke out and when EU institutions were taking decisions that would have an enormous and (with hindsight) negative impact on the everyday lives of European citizens, attention continued its downward trend to an average of just 3.4 per cent. Last year saw a reverse of this downward tendency, not because mainstream German parties have suddenly realised that European issues should be back on the agenda, but because a new party focused on Germany’s role in Europe, Alternative für Deutschland (AfD), has pushed the average upwards. In sum, since the Treaty of Amsterdam (1997), German parties have dedicated increasingly less space to discussing European issues in their electoral manifestos, despite the fact that two more treaties have emerged during this period (the Treaty of Nice in 2001 and the Treaty of Lisbon in 2007) and despite the fact that the very existence of the euro has been at stake during the debt crisis of 2010-2011. It is precisely this gap left by German mainstream parties that has been filled in by the emergence of the AfD. Figure 1 shows other interesting data, too. Sentences have been disaggregated into positive and negative references to Europe so that it is possible to look at them separately. Not only have German parties given less relevance to European issues in the last 15 years; they have also started to talk in negative terms about Europe. Since 1998, the percentage of negative sentences about Europe in German manifestos has increased, with the year 2013 constituting the highest point so far. This is again partly due to the influence of AfD on the calculation of the average. However, the increase in negative sentences had started before AfD was established. In fact, negative sentences, even if in very low numbers, began to appear after 1998, when a Red-Green government came to power. Until then, all sentences addressing European issues had always been positively framed (with only one exception in 1961). This fits well with what we know about the German debate on European integration. Most politicians and intellectuals have historically been favourably disposed towards European integration, just as the data in Figure 1 shows. As Müller has put it, “Euroscepticism as a principled suspicion of integration (and as a set of nationalist feelings) remains almost a political taboo [in Germany]”. The Manifesto Project’s data demonstrate that this may no longer apply. A long-held taboo is being broken before our eyes. Figure 2 presents the evolution of EU positions as reflected in the manifestos of the three main German parties, SPD, CDU/CSU and FDP. Positions are calculated by subtracting negative statements from positive ones. If the position score is negative, it means that negative statements are more numerous than positive ones in a given manifesto. The white line shows the all-parties average, including the Greens and other minor parties such as the Pirates and AfD. Let us look first at the aggregate white line, the one that measures the all-parties average. In 2013, for the first time, the aggregate EU position of the German party system was negative. Again, this is mainly due to the influence of AfD, but there is more to it than just that. Favourable European positions started to turn less pro-European after 1998, becoming increasingly less pro-European with each election. The CDU/CSU was at its most pro-European in 1987, just after the Single European Act of 1986. Between 1990 and 1998 the CDU/CSU manifestos were still highly pro-European, with the position moving between 5 per cent and 6 per cent. This is when the Maastricht Treaty was approved (1992) and the EU took a characteristically neo-liberal shape. The pro-Europeanism of both the FDP and the SPD grew during these years. The FDP’s pro-European position was 3 per cent in 1990 and it grew to 10 per cent in 1998, after the Maastricht and Amsterdam Treaties. Similarly, the SPD’s pro-European stance grew from 2 per cent to 6 per cent during these years. We find it difficult to explain why the SPD became more pro-European just at a time when the EU was becoming precisely what the German left always feared, i.e. the exact opposite of the democratic socialist Europe they had hoped for. In any case, after 1998 all three main parties turned less pro-European, the FDP consistently so, and the SPD and CDU/CSU with a small pro-European movement in 2009 that has returned to its downward path in 2013. The German manifestos at the 2013 election have positioned themselves at historically low points. 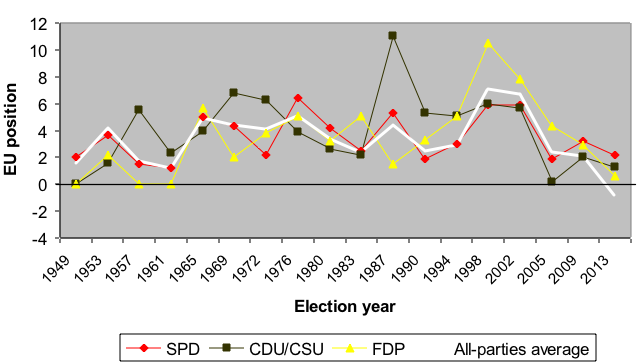 The SPD’s 2013 position has been lower only at four previous elections (1949, 1957, 1961 and 1990); the CDU/CSU’s 2013 position has been lower only twice (in 1949 and in 2005); the FDP has returned to the positions it kept during the 1950s and 1960s. As a final point, we can illustrate a snapshot of the 2013 elections. 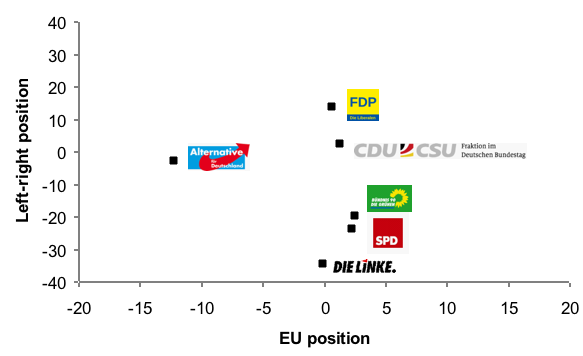 Figure 3 shows the position of German parties along the left-right and pro/anti-EU scales. It comes as no surprise that AfD is strongly anti-European (although it can hardly be characterised as an extreme-right party). Among the rest of the German parties, the FDP – on the furthest right position – and Die Linke – on the furthest left position – are the less pro-European, probably for very different reasons. The winner of the election (CDU/CSU) is located in between the FDP and the SPD along the pro/anti-EU scale, but is twice as close to the FDP along the left-right scale as to the SPD. Therefore, the two coalition partners are closer on European issues than they are on their respective left-right positions. How this will reflect in actual policy is yet to be seen. If we have to guess from previous grand-coalition experiences, the new German government will probably lean towards the right of the left-right dimension. Note: A negative value in the vertical axis indicates that a party was more left-wing, while a positive number indicates that their platform was more to the right of the political spectrum. A negative value in the horizontal axis indicates that a party had a negative platform toward the EU, while a positive value shows the opposite. To sum up, the data based on the content of German parties’ manifestos seems to support the claim that Germany does not wish to be the European hegemon and, if it is, it is despite the wishes of its political elite and not because of them. Rather, it seems as if German parties have been shying away from the European project for the last 15 years, just at a time when Europe needs them more. This is why all the self-congratulating reactions about the new German government and its more pro-European stance seem to be utterly premature. Sonia Alonso is a Research Fellow at the Social Science Research Center Berlin (WZB).